What do the periods spent in both opposition and government by the Conservatives since 1945 tell us about what drives parties to change their sales-force, the way they organize, and the policies they come up with? Using internal papers, memos, and minutes of meetings from party archives, along with historical and contemporary accounts, memoirs and interviews, Tim Bale‘s recent book maps the extent of change and then explores what may have driven it. Timothy Heppell recommends the book to students of political history. 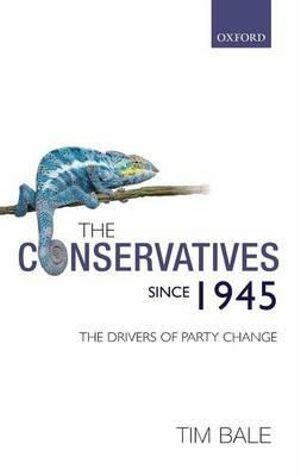 The Conservatives Since 1945: The Drivers of Party Change. Tim Bale. Oxford University Press. 2012. In recent years Tim Bale has established himself as the preeminent academic working on the Conservative Party. His reputation was confirmed by the publication of The Conservative Party from Thatcher to Cameron (2010) which was widely acclaimed both within academia and beyond. The standard that Bale set with this publication meant that expectations would be high when he published The Conservatives since 1945: The Drivers of Party Change. In both publications Bale was keen to advance the analytical value of political science approaches over traditional historical narrative. In Thatcher to Cameron he used an analytical framework based on examining ideas, interests, and institutions as a way of understanding how and why the Conservatives failed to recover after the trauma of 1997. In Drivers of Party Change he again claims the value of exploiting political science approaches. Here he examines the extent of party change in terms of the public face, organisation, and policy. He also goes on to consider what factors were driving these processes of change: electoral defeat, the impact of the party leader, or a dominant faction. Bale then subdivides post-war Conservative Party history into six distinct periods: Disaster and Deliverance 1945-1951; Anxiety, Appeasement, Affluence and After 1951-1964; Amateur to Professional 1964-1970; Betrayal 1970-1974; Confrontation and Consensus 1974-1979; and Messiah to Meltdown 1979-1997. Each period is assessed against the aforementioned criteria, with Bale relying heavily on a broad range of resources – internal papers; memos of meetings from party archives, and memoirs and interviews – to piece together detailed appraisals of each period. The outcome is a book of the highest quality. The value of the analytical framework that Bale advances is evident in the conclusion where he provides the reader with a comparison of the drivers of change across these distinct periods of post war history. This approach ensures that the book is significantly different from the existing books on twentieth or post-war Conservative history. What makes Bale such a distinctive and valuable writer on contemporary party politics is his ability to communicate and appeal to different types of reader. Academics will find the book has considerable academic depth through its engagement with a diverse range of sources and approaches. However, the general reader who is interested in politics and parties, can engage with the analysis as it is jargon free. It seeks to interest the reader by communicating in an accessible way. This is to be commended and many political scientists could learn from Bale and abandon their convoluted methodologies and tortuous prose that serve to alienate rather than educate. Above all else, this is a book that will be of tremendous value to students of the Conservative Party and British political history generally for many decades. I have two quibbles with the book, however. First, some scholars of Conservative Party history might take issue at the subdividing of the periods and the balance between the space that has been devoted to each period. Change appears to be associated with periods in opposition and then government and it would appear that change is predominantly driven by opposition. The periods of opposition that were 1945-1951; 1964-1970 and 1974-1979, which cover 17 years warranted 147 pages of analysis; whilst the 35 years of government (1951-1964; 1970-1974 and 1979-1997) are covered within 144 pages. Second, Bale excludes the period after 1997. He justifies excluding this period on page 2, arguing that this period has been ‘picked over’ in ‘considerable detail’ not least by himself, but others, notably Dorey, Denham and Garnett, and also Hayton. Whilst this is true, some might argue that the opposition period post 1997 should have been included to provide a fully comprehensive appraisal of the drivers of party change. Overall, however, these are minor quibbles. Bale lives up to the expectations that he has set for himself. This is another publication that will be subject to extensive praise by academics and political commentators. Dr Timothy Heppell is a Lecturer in British Politics within the School of Politics and International Studies (POLIS) at the University of Leeds. He is the author of Choosing the Tory Leader (2008) and Choosing the Labour Leader (2010). Read more reviews by Timothy.